The Plotter Art™ Seamless Texture Tile Collection Volume 2 includes 600 beautiful, highly detailed images on DVD-ROM and a 48 page, full color printed User Guide and Image Catalog or as a downloadable version with a 48 page, full color user guide in PDF format. Each image has been carefully created with the primary aim of being used as a design component in the creation of high resolution designs for print or for print and cut production. Most of the images include extensive use of lighting and three dimensional effects which provide a level of complexity, depth, detail and realism that will make your designs come alive. Because each image is a seamless texture tile, they are ideal for creating larger backgrounds and fills for wraps and other design needs. Tiles are simply placed next to one another to create as large a high resolution background as needed for your design. The join points, or seams, are not visible even in huge prints. All images are uniform in size, 3600 x 3600 pixels, and will repeat seamlessly in your favorite image editing program. Most images will tile seamlessly on all four sides. A small percentage are limited by their design to tiling only horizontally or only vertically. All images are mastered as Photoshop files and then used to create first generation JPG or PNG files for your ease of use. Most images are provided as Maximum Quality JPG files while those which utilize transparency are provided as PNG files. Plotter Art™ Seamless Texture Tiles are intended for use in systems designed for printing with process colors. They are fully suitable for all forms of process color printing and for incorporating into larger designs. The collection size totals almost 2.2 GB of data and is provided on DVD-ROM with a 48 page full color printed user guide or as a downloadable version with a 48 page, full color user guide in PDF format. All images in the collection may be viewed online. 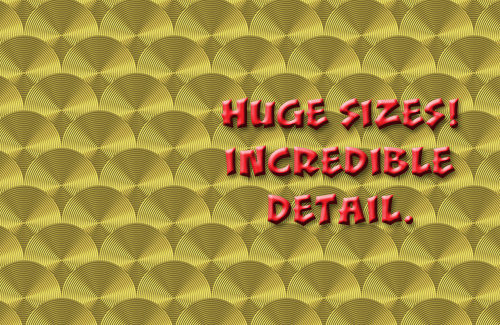 Plotter Art™ Seamless Texture Tiles Volume Two is available on DVD-ROM or as a download. For greater savings, check out our Value Bundles.